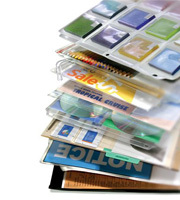 Bardes’ products PROTECT, DISPLAY, PROMOTE AND ORGANIZE critical documents, promotional materials, rate cards, photographs and slides, business cards, CDs and DVDs and more. Adhesive backs, magnetic strips attached to the back, zip-locks, and flaps give documents protection and visibility in all work environments. For more than 35 years, Bardes Products has been manufacturing and distributing business and industrial products made of clear, frosted and colored flexible vinyl. Bardes’ specializes in plastic envelopes, pouches, holders, sleeves, pouches and jackets in all sizes, configurations, and designs. Bardes heat-seals vinyl into pockets and envelopes with the added capability of hot die stamping, 4 color process printing, embossing or de-bossing. Add grommets, reinforced hang holes, colored edges or headers, multiple pockets, angled openings, opaque, tinted or PMS colors for a custom look at an economical cost.